My five-year-old grand-daughter loves anything to do with princesses; the way she identifies a princess is by her long dress. She picked up a book at the library the other day that had a little girl in a long dress on the cover. However, the girl in the dress was not a princess, but a bride. 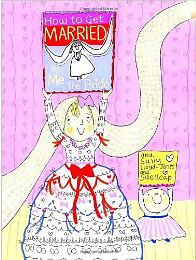 The book is called How to Get Married by Me, the Bride by Sally Lloyd-Jones and Sue Heap. It’s published by Random House, 2009. According to the listing at Amazon, the book is intended for 4-8 year olds. The product description and various reviews call the book “hilarious,” “witty,” “charming,” and the like. I find it a bit disturbing. lots of people at once. Not everyone gets married in a church, but it does seem strange not to include a church as a possible location for a wedding, and the word aisle does not mean “a long path.” An aisle is a division of a church, or at least, by extension, a passage between rows of pews, seats, or the like. I feel that children’s books can appeal to a child’s sense of fun without promoting misunderstanding. And I don’t think that little girls of 5-8 need to learn to equate mere civilized behavior with finding a marriage partner. Hmmm, I agree with you. These comments, though perhaps comical to adults and perhaps to some children, send the wrong message. I have no objection to humor, but when it distorts the main idea of marriage, it is out of place. Good article, Maeve. I dislike the glamorization also and as a grandparent can see that these images and stories have an effect on young girls. My 5-year-old is already thinking about how these things work.